This page is an organic collection of old work and thoughts in no particular order. The old Pink Floyd album always made me think of something a bit more literal and nuclear. I made three in the mid-Nineties – kept one, sold one on consignment at Route 66 Gallery 50 Penn Place and sold one at an art show. I made a follow-up series years later. They were much smaller about the size of a quarter including pendants, earrings and brooches. I have no idea where they are but would love to see an image if, by chance, anyone one of the series. As I recall, nobody bought a full set. Um, yes, about the oxidation. When I began making jewelry in 1991 the price of silver was less than $4/oz and I was sitting on a small cache of rounds, ingots and coins left after the notorious Hunt brothers’ audacious Silver mistake. I was in high school in the late 70’s and scanned daily quotes of the Dow 30, precious metals, pork bellies and other data as if the numbers hid a secret. Mix this capital data with income from working 50-70 hour weeks in the summer for a landscaping company you end up with a kid with 4 guitars (Gibson ES-150DC walnut, Gibson ES-175 natural, Alvarez-Yairi DY-77 which played/sounded better than any Martin I tried, Epiphone 12 string acoustic FT-165, and a Marshall solid state 50 watt) and still more money than brains, so, I started buying silver at coin shops around Tulsa. My first buy was a sleeve of quarters at spot $4.75/oz in 1977 and every once in a while Engelhard Prospectors, ingots, and so on. The small box was full in 1980 but as prices kept dropping I stopped buying because, by this time, I understood the facts related to industrial value, supply and demand and the hopelessness of seeing $50/oz silver. So… 1991 comes and I want to give a gift to Emily. Lizard brain turns on: I have silver, silver sparkles and is made into jewelry, I have tools, girls like jewelry, I will make jewelry. It can’t be that hard. Bought McCreight’s bench manual and started hammering the Engelhard ingots flat – all of my early work is .999 fine 🙂 My anvil was a 3 pound ball peen hammer set in a large Starrett bench vise and the noise from the blows was the music of creation for me. Pound, anneal, quench, repeat. 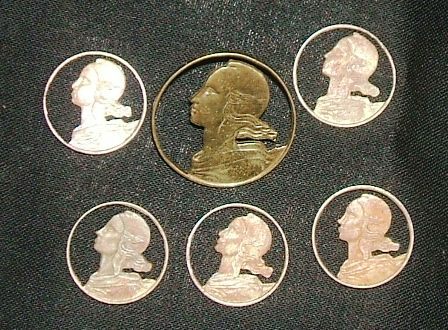 My first project was learning to use the piercing saw so I practiced on French coins cutting out the profile of Marie. 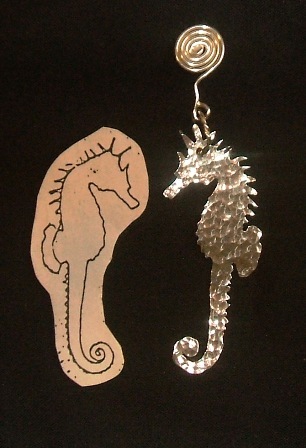 Then I made a tracing of a seahorse, glued this to my forged sheet silver and went to work. The second design was a fishbone earring. Each bone hammered from strips then soldered to the spine piece with hair-thin iron binding wire holding each piece.